Fresh and citrusy, like lemon or lemon grass. See also lemon myrtle. Balm leaves contain no more than 0.1% of essential oil which is of complex and variable composition. Among the more than 50 aroma compounds yet identified, citronellal (dominantly the (R) enantiomer, see also kaffir lime), β-caryophyllene, neral, geranial, citronellol and geraniol amount to about 70% of the oil. The composition is similar to that of lemon grass, but balm oil can be identified by its typical pattern in chiral compounds; for example, enantiomerically almost pure (R)-(+)-methyl citronellate is a good indicator of true balm oil. Lastly, determination of carbon isotope ratio by IRMS (isotope ratio mass spectrometry) is also capable to distinguish between the two oils. (Pharmazie, 50, 60, 1995). Balm is a short­ened form of balsam, deriving from Latin balsamum balsam tree , which was also used for the resin obtained therefrom ( Balm of Mecca ). The ultimate source of the word is Old Hebrew boshem (modern bossem) [בשם], which denotes the balsam tree (Commi­phora opo­balsamum syn. Amyris opo­balsamum, Burser­aceae/Rutales) and its resin, but also means fragrance or spice in general. It also appears as busma [ܒܤܡܐ] in the Aramaic New Testament. The Latin species name melissa is shortened from Classical Greek melisso-phyllon [μελισσο-φύλλον] bee-leaf ; the plant is rich in nectar and commonly planted to feed bees. That name is akin to Latin mel honey and also the British term for orange rind jelly, marmalade. Similar associations referring to bees are found in several European languages, e. g., Yiddish honik-melise [האָניק־מעליסע] honey-balm , Dutch bijenkruid bee herb or Hungarian méhfű (also mézfű) bee grass . Cf. also Chinese xiang feng cao [香蜂草] fragrant bee plant and English bee balm for the related plant bergamot, Monarda didyma. Also the Bulgarian name matochina [маточина] refers to the bee feeding quality of lemon balm: Bulgarian matitsa [матица] bee queen , derived from Common Slavonic MAT’ mother (in modern Bulgarian majka [майка]). Similar remarks apply to Czech meduňka, Slovak medovka, Serbo-Croatian matičnjak [матичњак] and related forms. Another Bulgarian name of lemon balm, pcheliak [пчеляк], is directly derived from pchela [пчела] bee (from the Proto-Indo–European noun bʰei-, which also gives English bee). Because of the prominent lemon fragrance, many names of balm contain an element referring to that citrus fruit. Often, this element is optional with emphasizing character, as in German Zitronenmelisse (actually, Melisse is the same plant); yet in other cases the lemon element is essential in the name, which then often translates to lemon plant or similar, e. g., Portuguese erva-cidreira, Hungarian citromfű, Italian erba limona and Dutch citroenkruid lemon-herb ; in the same spirit, there are Ukrainian lymonna trava [лимонна трава] lemon-grass and Arabic raihan al-limun [ريحان الليمون] lemon-basil (or lemon-fragrance , see basil). See lemon and lime for the etymologies of the names of lemon mentioned here. 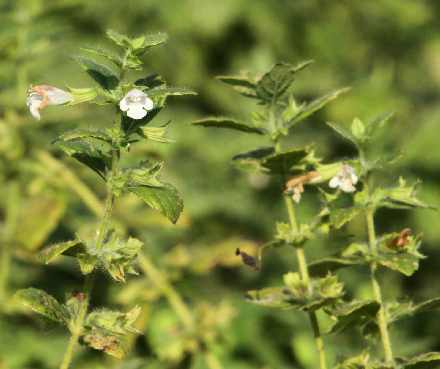 The Spanish name of lemon balm, toronjil, appears to be related to Arabic turijan [تريجان] lemon balm but I don’t know any details. Perhaps, it is related to Arabic utruj [أترج] and its Hebrew cognate etrog [אתרוג] citron . Note, however, that Spanish toronjil morado purple lemon balm , refers to Agastache mexicana, another herb of the same plant family which has a superb lemon fragrance. The latter plant is in English often termed Mexican Giant Hyssop or Lemon Hyssop , although it is no more related to hyssop than to lemon balm. Swedish hjärtansfröjd heat’s delight probably refers less to balm’s pleasant fragrance, but more to the usage of lemon balm against nervous heart diseases in folk medicine. The same holds true for the analogous German local name Herztrost. 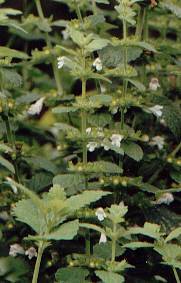 In Japanese, lemon balm is known as seiyō-yama-hakka [西洋山薄荷, せいようやまはっか]. This formidable compound can be broken down to hakka mint which is augmented by the element yama (see also Sichuan pepper for the readings of the Kanji 山). Thus, we get the compound name yamahakka (literally mountain mint ) which denotes the native plant spurflower (Rabdosia inflexa). The second prefix seiyō means foreign . Incidentally, seiyō-hakka is the Japanese name of English-type peppermint. 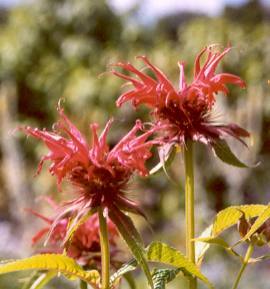 The genus name of bergamot, Monarda, was given in honour of Nicholas Monardus, a Spanish botanist (1493–1588). 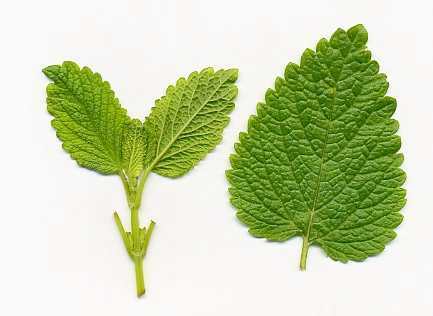 Lemon balm is less a spice than a medical herb, in past times much used against stomach ailment and nervous conditions. It has, however, some value as spice, because of its fresh and pure lemon taste, which makes it a perfect substitute for fresh lemon grass or (in dried form) sassafras. 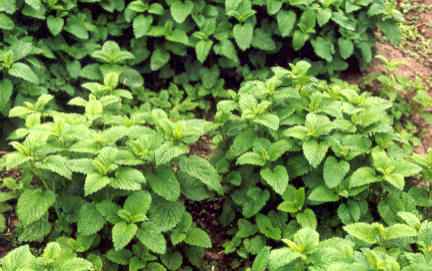 In Central Europe, lemon balm is sometimes used to flavour sweet drinks. The leaves make an interesting decoration on many dishes and may be used generously if you (and your guests) like the aroma. They fit best to fish, poultry and salads; it is also suggested to use balm leaves for any dish containing lemon juice to get a more intensive lemon aroma. If available, the fresh leaves are to be preferred. True lovers of this herb may want to try a pesto made of lemon balm leaves instead of basil. Although lemon balm is not one of the traditional seven herbs used for the Frankfurt Green Sauce, it is a recommendable addition to this traditional recipe (see borage). Lemon balm has a great affinity for fresh fruits, especially apples; thus, it is sometimes found in apple-based desserts. Balm can also be used to flavour other fruits, fruit salads or fruit-based desserts (see also lemon verbena). Because herbal vinegar is mostly made from apple vinegar, it may benefit from a few balm leaves (see dill). Bergamot (not to be confused with the homonymous orange relative) is a related plant with similar, yet harsher and less lovely flavour. Bergamot is rather popular in the USA for infusions; this usage dates back to the Oswego Indians and has some historic significance (Boston Tea Party).